My Favorite Mini Sessions are coming soon! 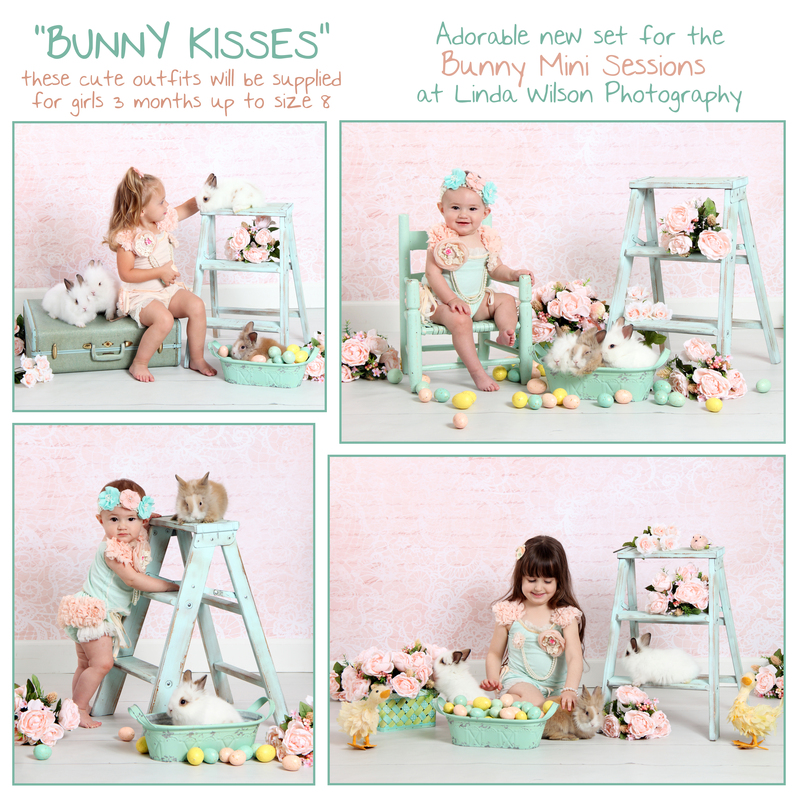 Live baby bunny mini sessions at Linda Wilson Photography! 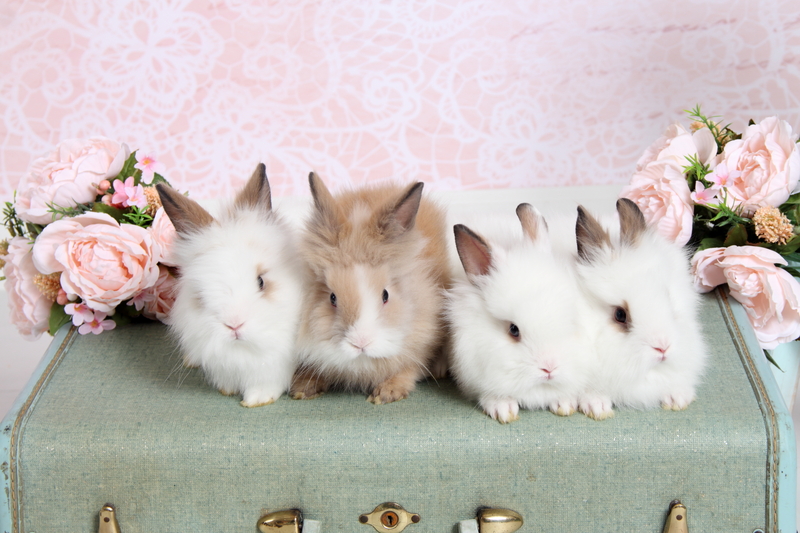 I have the cutest new baby bunnies growing up now and will be the perfect age and so fluffy! I will have several set choices including 3 new ones! I’m super excited. 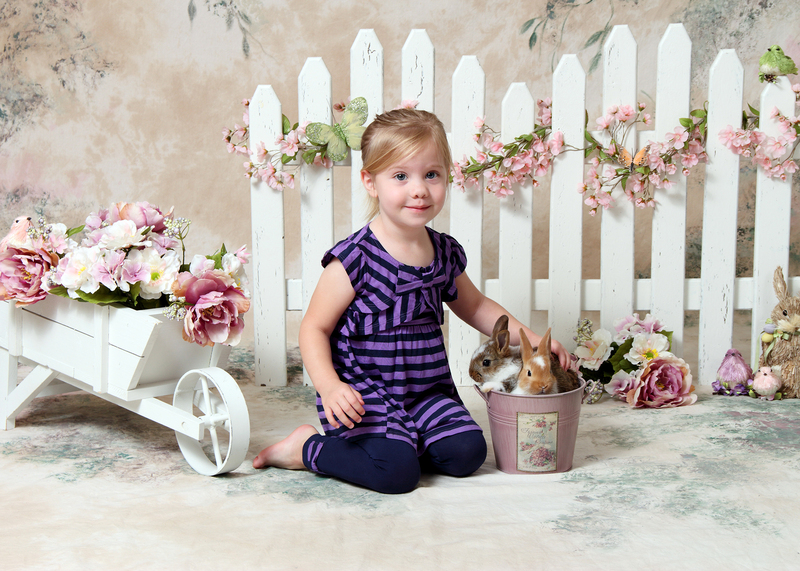 Follow my Facebook page (under the Bunny Mini Session gallery) and also my Facebook event for the Bunny Mini Sessions. Click “interested or going” to get all the updates. 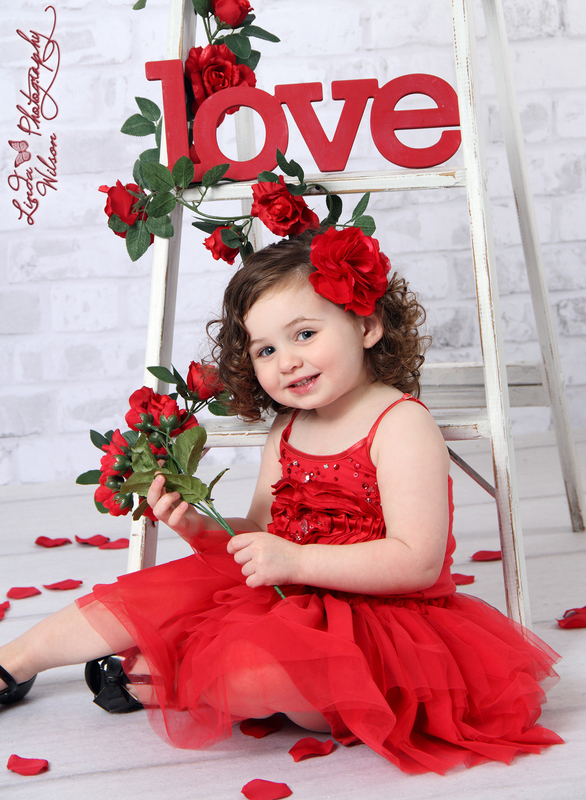 $150 for mini session, extra time slot for viewing right after, and your choice of your favorite 5 digital photos (or 8×10 prints if preferred) with option to purchase more. 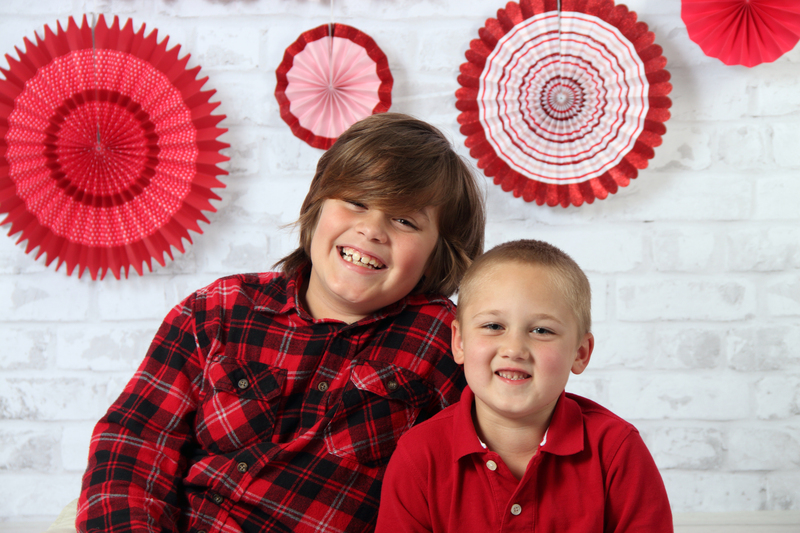 $250 for the mini session, and ALL the best digital photos. At least 25 images but probably more! Here are a few of the previous setups shown below. Only 2 setups can be up each day, so if you know for sure you want a certain set, then book soon! New sets are going to be super cute too! One is called “Egg Painting Today” another is “Grandma’s Porch” and the other is “Spring Views in the Barn” Oh and the “Fairy Cottage” too! Wow, so many to choose from! 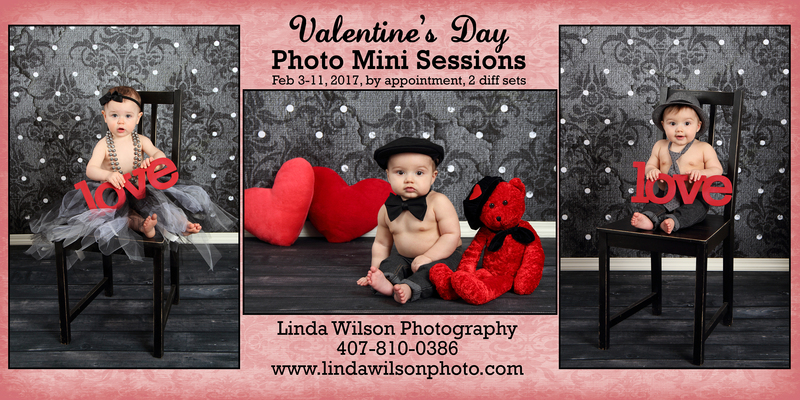 I’m so excited for my favorite mini sessions of the year coming up! 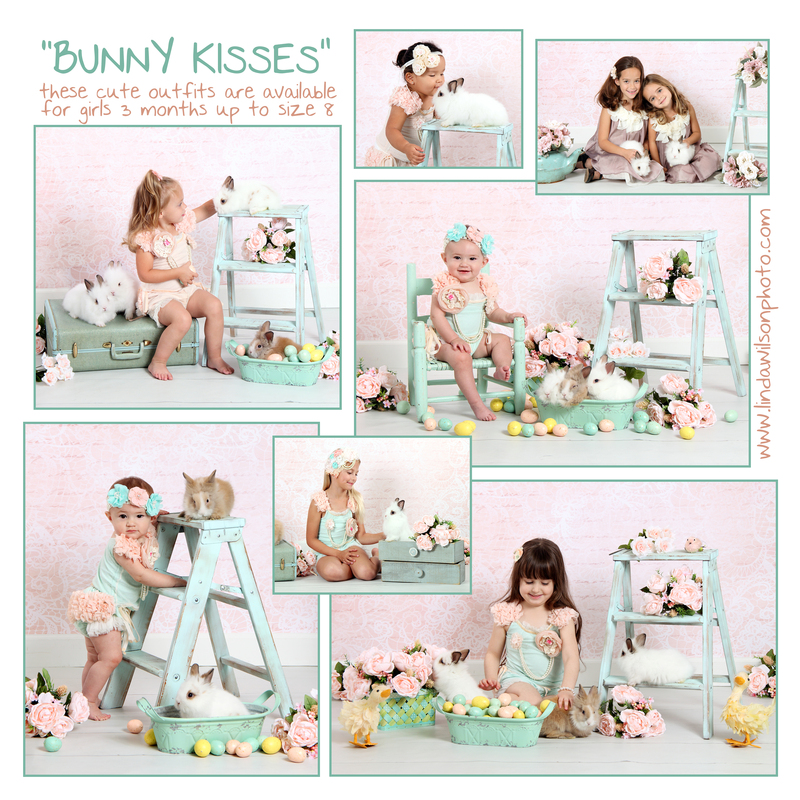 Live Baby Bunny Mini Sessions! 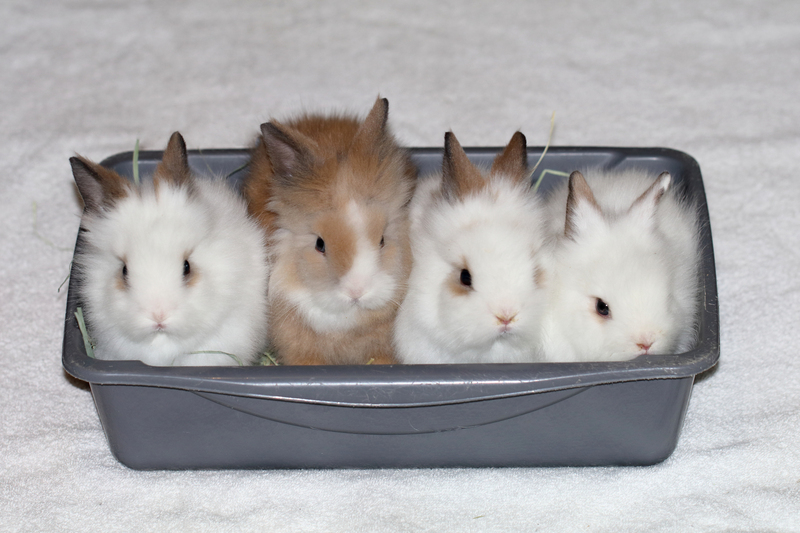 And this year I’m even more excited because these baby bunnies are very special. 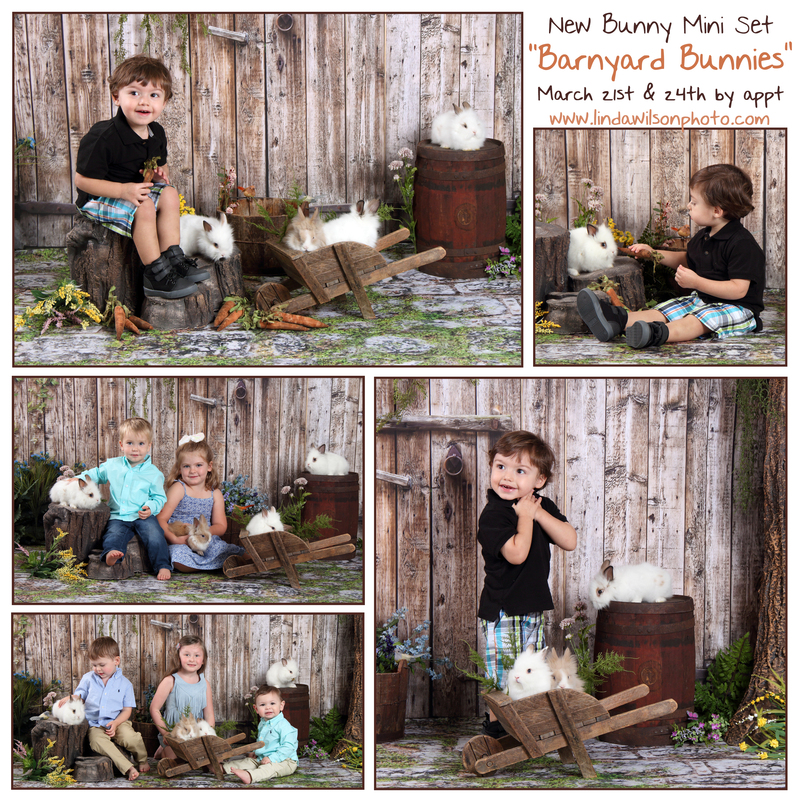 Two of my pet bunnies (that I kept from previous year’s mini sessions) got married and had babies! And they will be old enough just in time for the sessions! And I have to say, they are just adorable! What do you think? 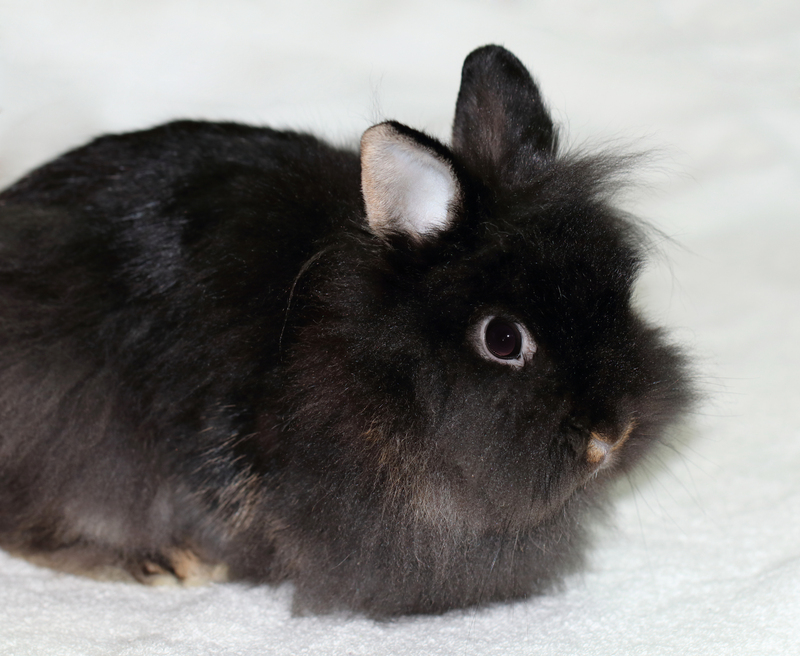 I may even have a guest appearance by the fluffiest cuddle bunny I have, “Chatter Box” a dark charcoal Lionhead bunny who is almost 1 year old. She is very sweet and soooo fluffy! 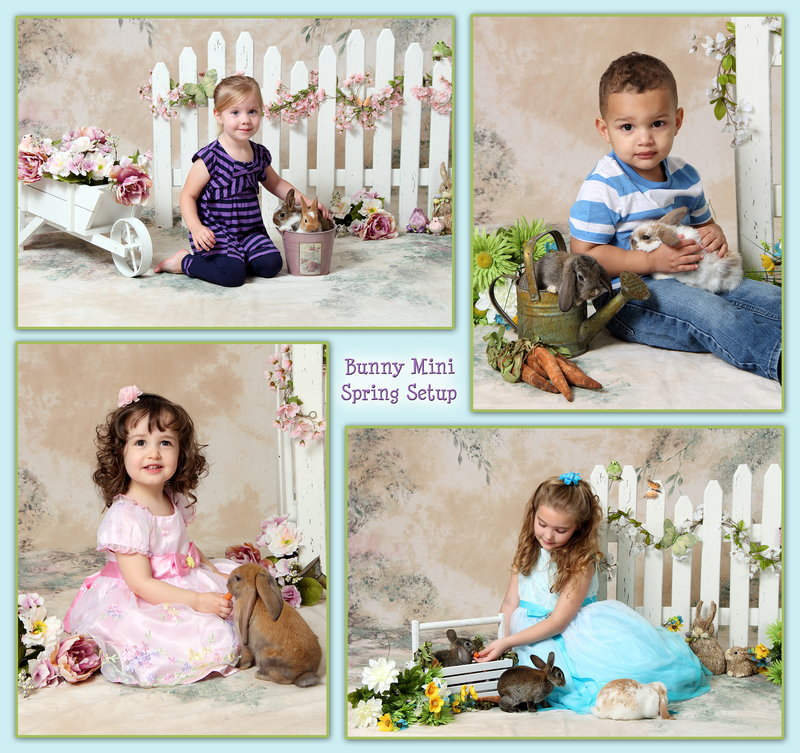 Here is my spring setup which will be one of the set choices: The color of flowers and props can be changed to match your child’s outfit. I also have some outfits if needed, such as tutus, dresses, and suits & ties for boys, but must be decided ahead of time. I’m also working on a new set or two that I think will be super cute. More details and sample photos will be posted on my facebook page in next week or two, so make sure to follow my page and join the fb event. 🙂 *hint: For one of the new sets, I’ll be providing the outfits for girls from 3 months old, up to size 6. I’ll also be offering this Rustic Setup as an alternative some of the days, so if you know you want this set for sure let me know at time of booking. *Only 1 optional set per day to go with this spring setup, so book soon if you want a specific setup! Samples of new set(s) will hopefully be shown soon. 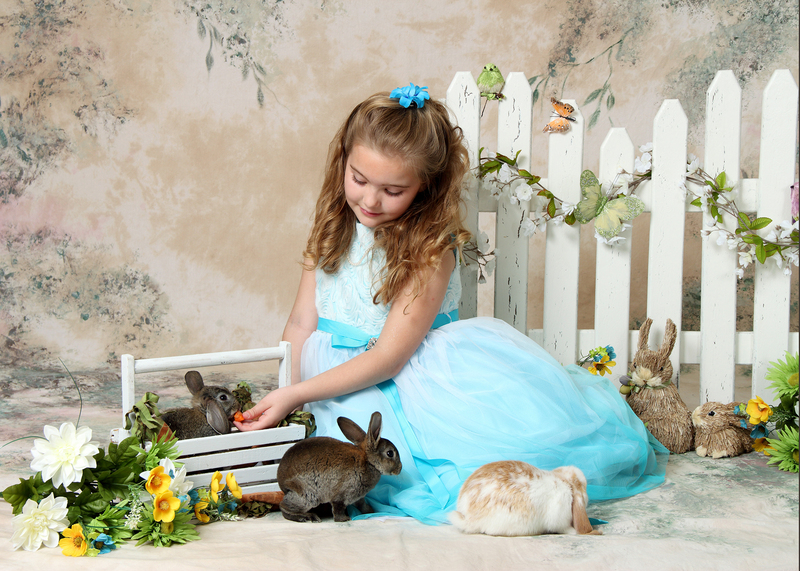 Only $150; Includes a 15 minute studio mini session with baby bunnies in a cute studio setup, a 30 minute viewing immediately following session, 5 gift prints of your choice, or high resolution digital photos if you prefer, where you can print your own. Additional packages and products will be available for purchase. *Ages 3 months and up. Email me at linda@lindawilsonphoto.com with your prefered date and time, with 1 alternate time choice too (on the hour, except noon, from 9am to 4pm) After your time is scheduled, then click here to pay for your session and hold your spot: http://www.lindawilsonphoto.com/store/session-options/sessions/bunny-mini-session Spots will be held for only 24 hours until payment, unless another arrangement is made. 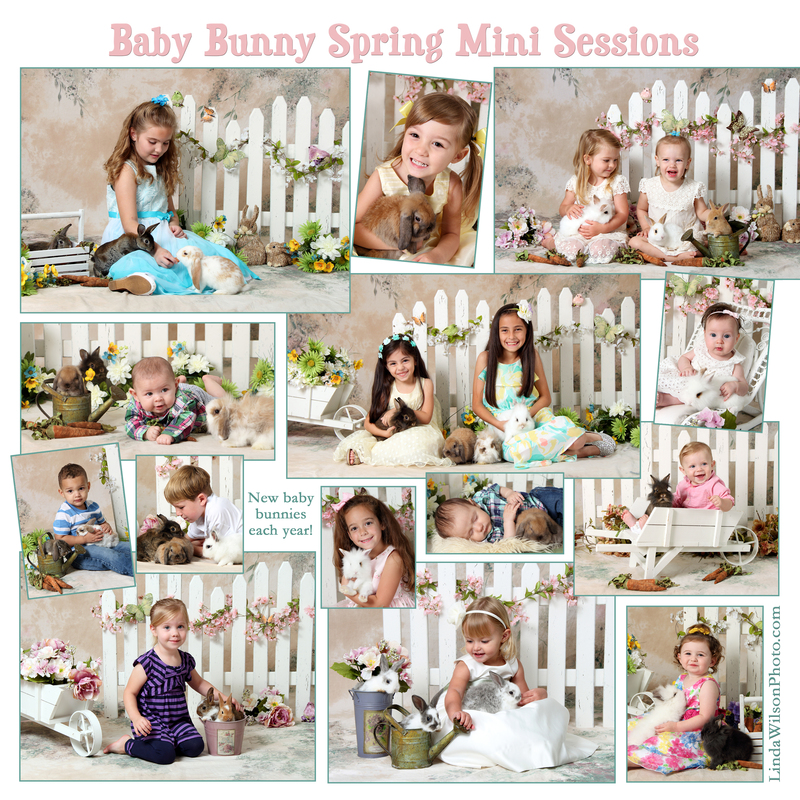 Finally it’s time for my most popular children’s mini session of the year: the Baby Bunny Mini Sessions! My personal all time favorite themed mini session! 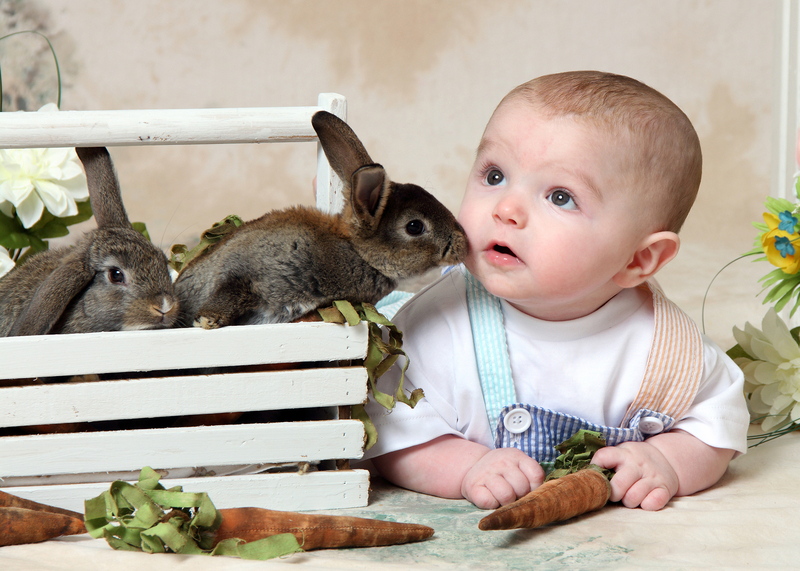 Children love it too because they get to hold, cuddle, & feed sweet little furry baby bunnies! I’m offering several different dates to give everyone a chance to participate in this fun spring session for their kids. 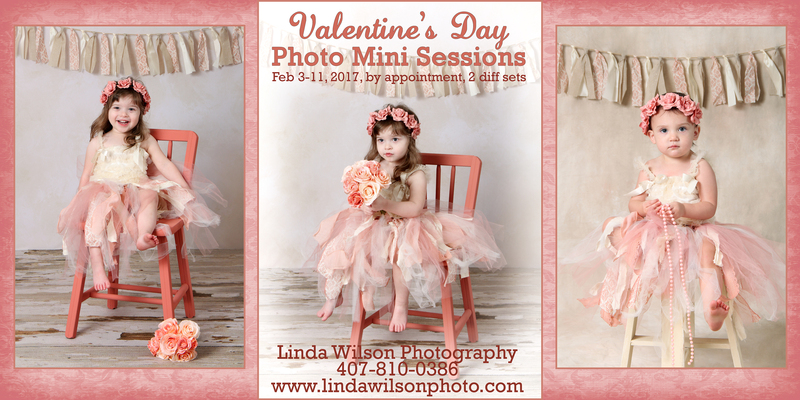 Email (linda@lindawilsonphoto.com) or call (407-810-0386) soon to book your child’s photo session time. More info below. There will be 3 different setups for you to choose your favorite. The first set of samples is my main spring setup, which has the white fence with variations of different colored flowers and a variety of props. The second set of samples as you can see is a more rustic theme, and I added the country barn theme, too, again with a variety of props to change it up. I’ll be posting new samples on my Facebook page and Facebook Event soon, so make sure to mark “going” or “interested” in the event to get the updates. 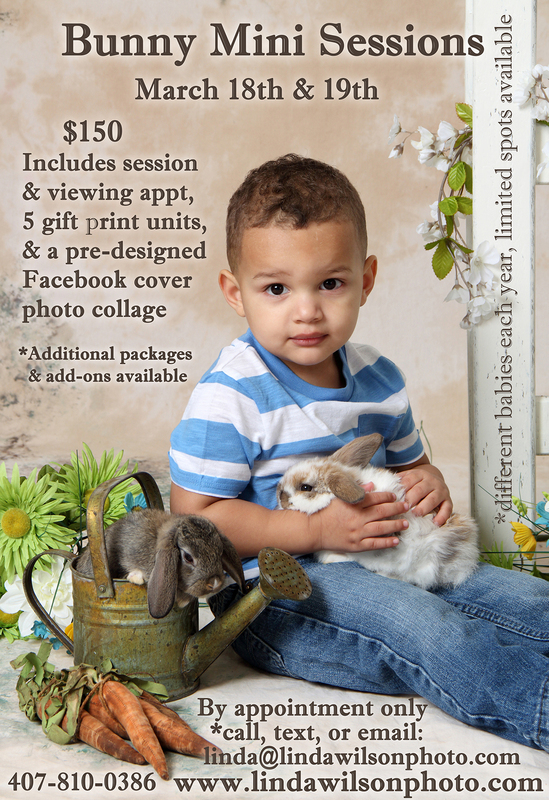 The cost is $150 for the 15 minute studio mini session with the live baby bunnies, (with choice of setup), a quick 30 min. 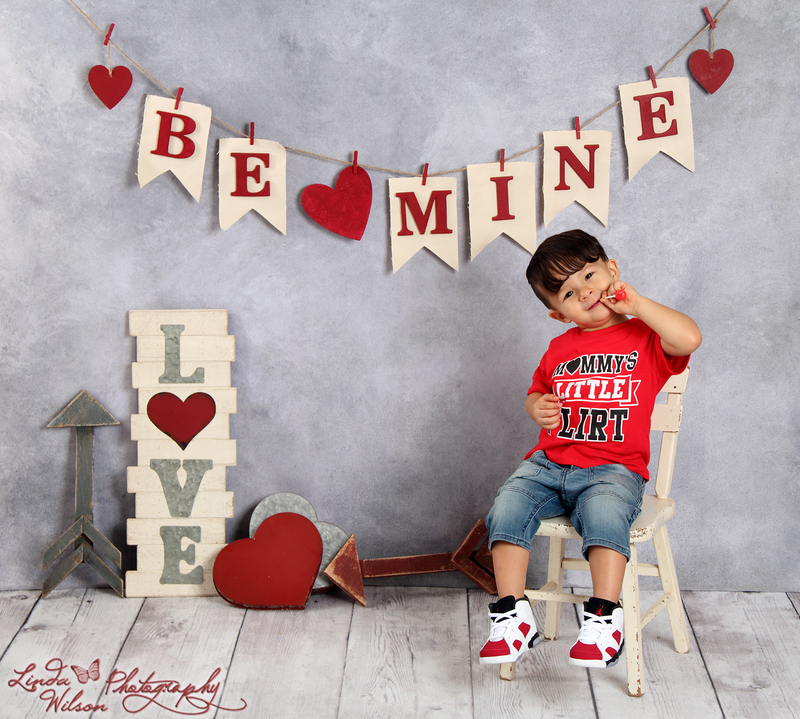 viewing immediately after session, and 5 of your favorite photos as your choice of either 5 gift print units (a unit is 1-8×10 or 2-5×7 set, or a set of 8-wallets) or 5 high resolution digital photos sent as a digital download with a print release. Additional packages and products will be available for purchase. 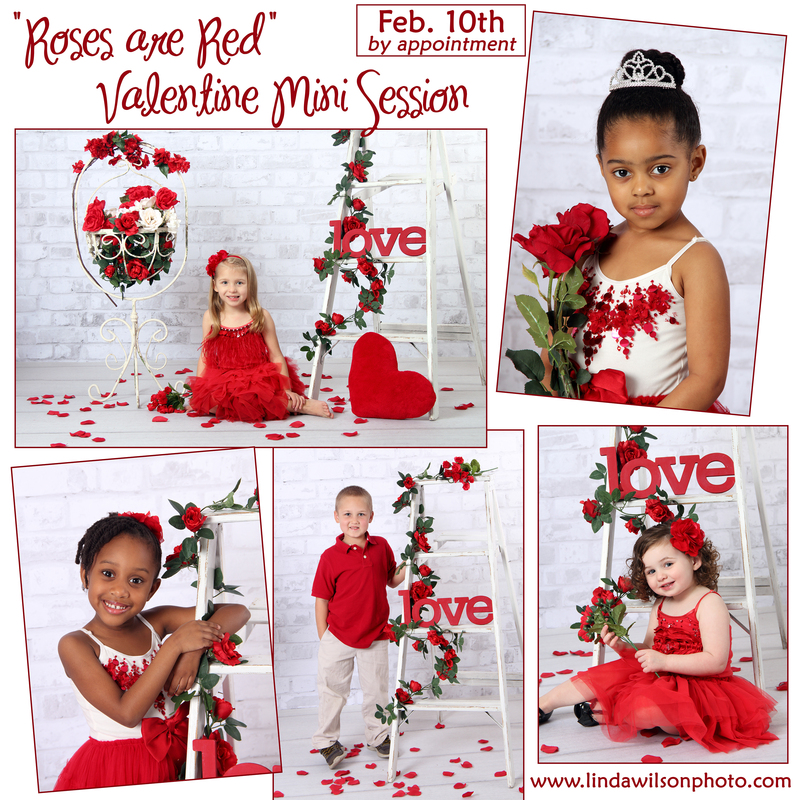 It’s that time again for my favorite children’s mini sessions of the year! Live Baby Bunnies! 2 days only on March 18th and 19th, by appointment. 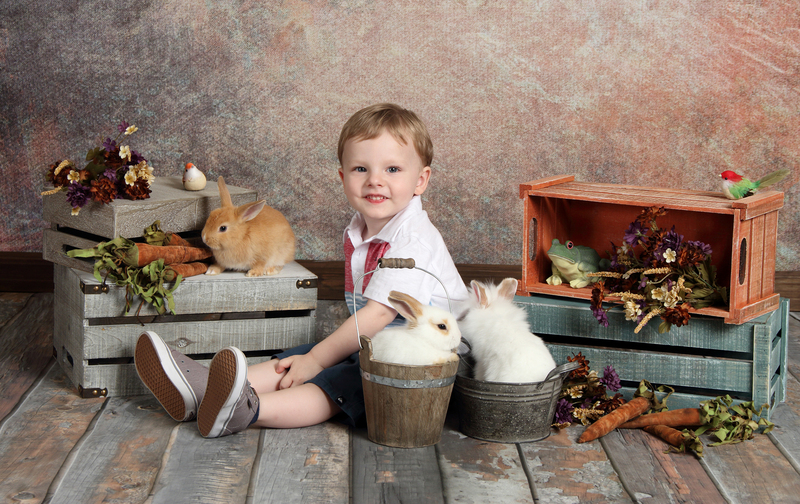 Schedule your children to come feed and play with cute baby rabbits and be photographed with them in a cute spring setup. 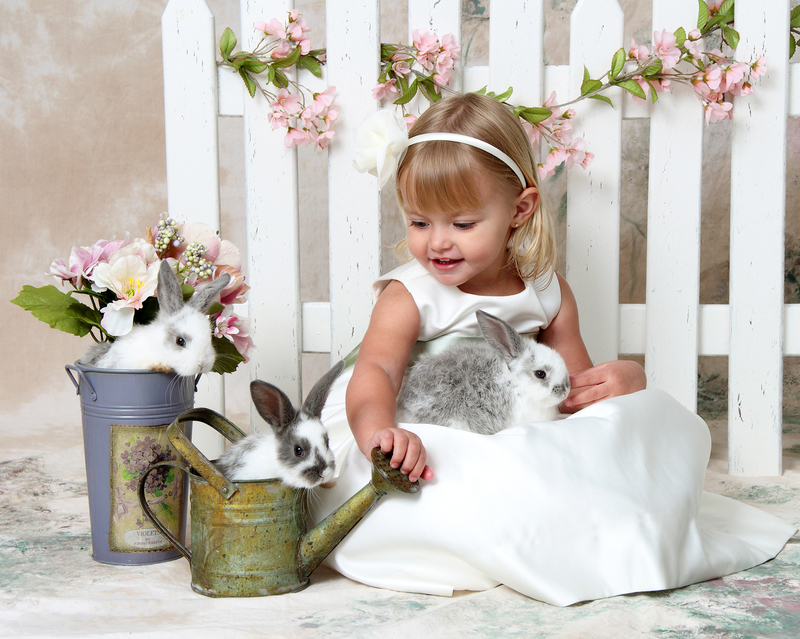 Every year I find new babies, so please note that the bunnies in the sample photos are from previous years, but it will be the same similar setup, with your choice of flower colors and props. I recommend pastel color clothing rather than bold bright colors for this set. I do have some clothing available for children but not in all sizes. 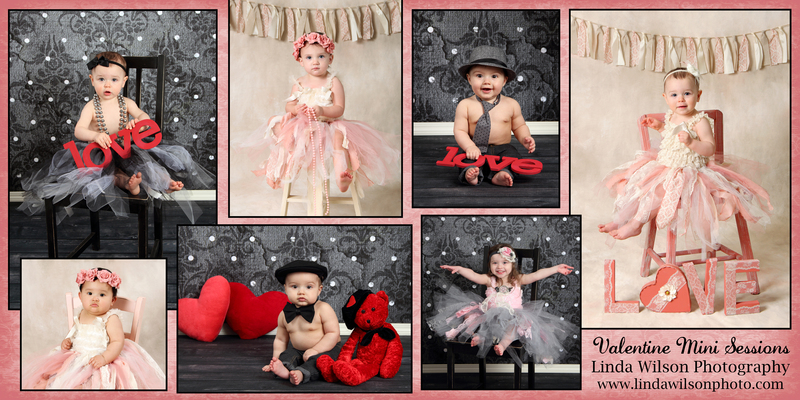 I have some dresses and lots of tutus, and small selection for boys too. 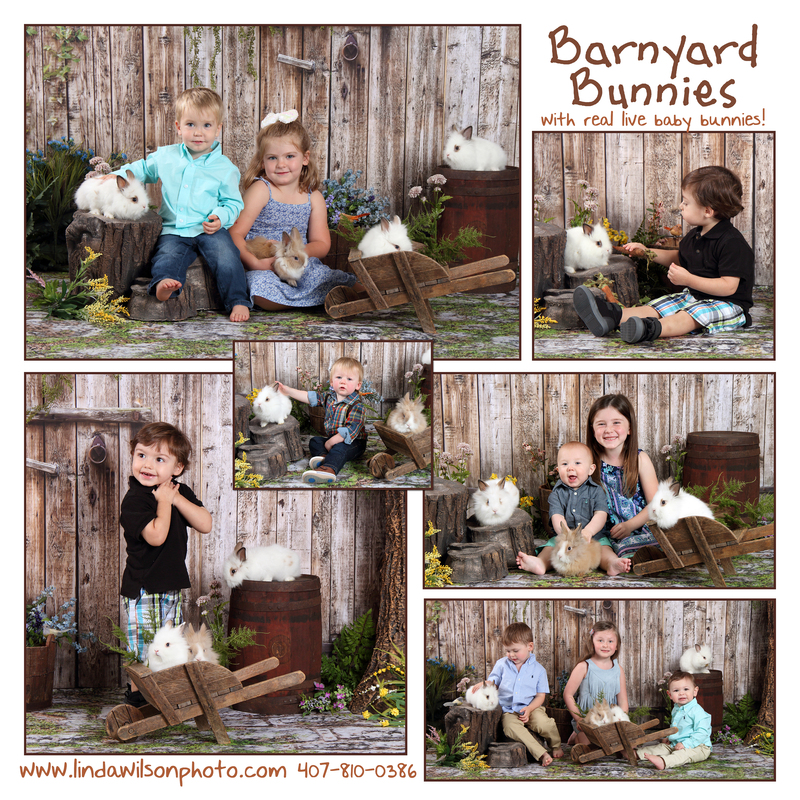 *If you are interested in the bunnies, but have done them before on this set and would be interested in a different setup, contact me to discuss as I have 2 other possible options. The minis are for children only, ages 4 months & up. 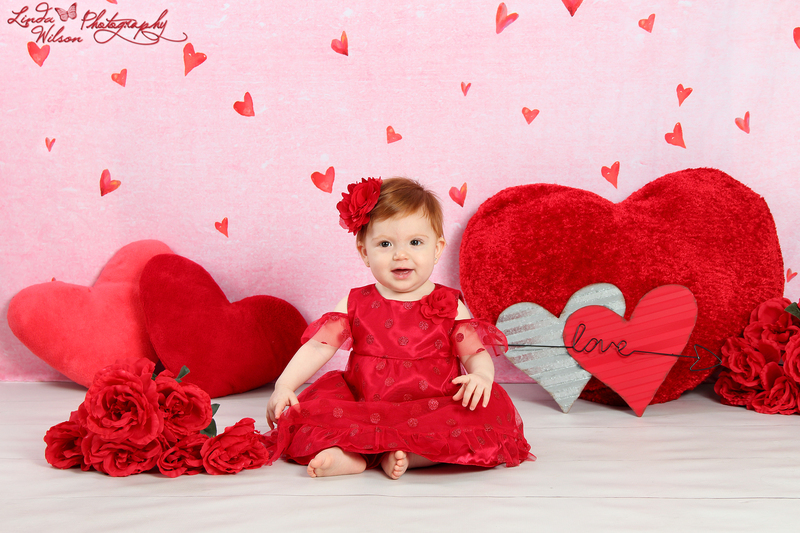 $150 includes: 15-20 min studio session, 30 min view/order immediately following session, 5 gift print units of your choice can be 5 different images, or combo of your favorites (a unit is your choice of 1-8×10, 2-5x7s, or 8 wallets) and a designed Facebook cover photo collage. Additional packages and add-ons will also be available. Spots are limited, so contact me soon to schedule an appointment for your child(ren) if you want a guaranteed spot. You can call, text, or email me with 2 different time choices (on the hour from 9 to 4, except noon) and I’ll let you know what is available. Then you may hold your spot by paying online on my website store under the services tab.